In this Blog we spotlight some of the great new games and changes to The Silver Show 2018 It’s A Knockout that we’ve introduced for this season. The Silver Show 2018 as a standard package has eight great games, is about half the size of a football pitch and covers up to 18 teams taking part. 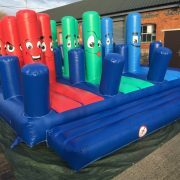 Six of these games use inflatable obstacles that are ran, climbed, squeezed, bashed or slid down making it an ideal set of games if you’re after a WOW-factor for your day. Just to balance the six inflatable games off, the Silver Show also has two slower team-type together games to add a bit of team building into the day’s fun and laughter. With great games such as our re-vamped dressing up sumo suit game “Off To the Beach” game, to the Kings Banquet, Pac Man and Kitchen Kaos, right up to the finale Game 8, the brilliant “Pea Soup” Bubble Pit Game, the Silver Show sets an impressive arena sight of inflatables, games, costumes and props. The Silver Show is also available in a ten game version for even more fun-fun-fun!!!! The Silver Show for Schools. We also have kids versions of the Silver Show games for schools, scouts, cubs, guides and youth days. These have had updates and changes for 2018 as well. The new inflatables and tweaks make it an even better set of games then ever. 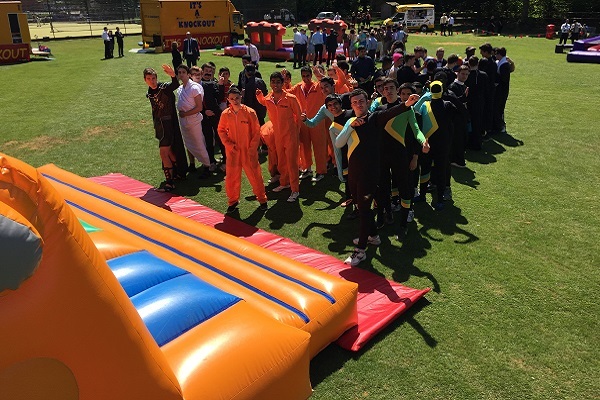 Year-on-year more schools are realising that one of our It’s A Knockout’s are a great adrenaline way to keep a year group (or even the whole school) active. For more information please see our Schools & Youth Knockouts page or Contact Us for details. As with all our sets of games. Ever one, in every team, takes part in every game. NO ONE IS LEFT OUT ! It’s time for us to reflect on 2017 and what a great year it’s been for our Knockout Challenge It’s A Knockout games. 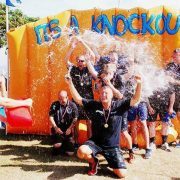 As usual, we’ve been the length and breadth of the UK with our It’s A Knockout packages for a variety of different Town and Village shows, Festivals, Gala’s, Charity Fundraising days, Family Days and yes, Team Building. From April till December (yes December!) our games have been entertaining the masses with fun and laughter, bubbles, water, costumes, inflatables and non-stop enjoyment. We’ve enjoyed 2017 immensely, and it’s been great that our games have helped so many charities raise lots of money for great causes and helped these charities spread their “word” and build bridges. We do particularly look forward to the public days as the teams really go to town on their fancy dress and the less-competiveness of the teams ads to a more fun event. A 2017 Gold Show set of games. This year we’ve ran our games for just a small day of 25 people up to Scout camps with 2,000. And even with the bigger numbers, as usual, every body, in every team took part in every game, No-one was left out. We’ve also noticed many more schools are using us now. When we run school and youth days, we change the games to be more adrenaline based. Some schools are even sharing a day, where we’ll operate the games in the morning for one school, then another are bus’d in or walk over to take part in the afternoon. Many are having a teachers session after school as a sort of team building exercise. Please visit our Schools Page for details. 2017 It’s A Knockout Teams. For more images of teams that took part in in of our 2017 Charity It’s A Knockout’s please visit our Flickr Page. We can’t sign off this blog without a footnote to our friend Keith Chegwin. We worked with him many times, and it was with great sorrow that we learnt of his death. He was a great guy, always happy, had a wicked sense of humour and we’ll miss him greatly. We’d like to thank all the organisers that put their faith in us for 2017, all the great teams that took part in our games. We hope to see you all next year for an exciting 2018 It’s A Knockout ! 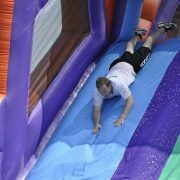 Please bookmark our Blog for news of some tightly guarded changes, upgrades, and additions to our It’s A Knockout’s for 2018. 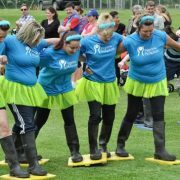 Ideas for some Fancy Dressed Charity It’s A Knockout Teams 2017. 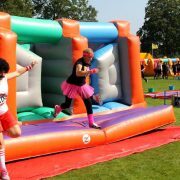 Over the last few months our It’s A knockout shows have been travelling the UK providing great fundraising events for charity days and town shows alike. Along the way, every now-and-then, we’ve collected a few pictures of the teams that have taken part. So for a bit of fun, we’re going to share some of the great costume themes that the teams have come along as. 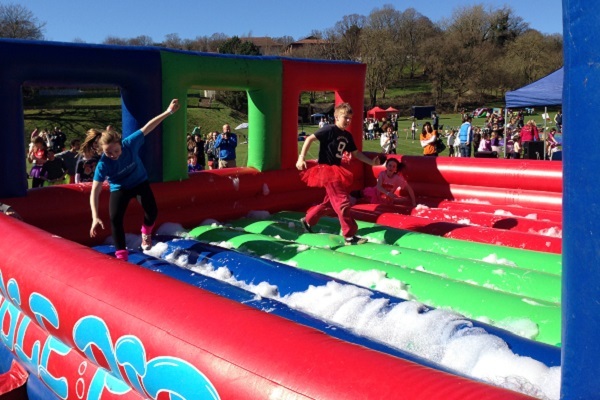 If you’re taking part in an It’s A Knockout, use them as inspiration for your knockout day out ! Fancy dressed It’s A Knockout teams. We love when teams come along in fancy dress. It adds colour to a day and helps us with team identification and so the scoring of the games. Examples shown here include themes such as “Super Hero’s” where the team has simply gone to eBay or Amazon and simply bought some costume attire (or gone to Primark for some Onesies), and other teams where a little more thought and inventiveness has been entered into. 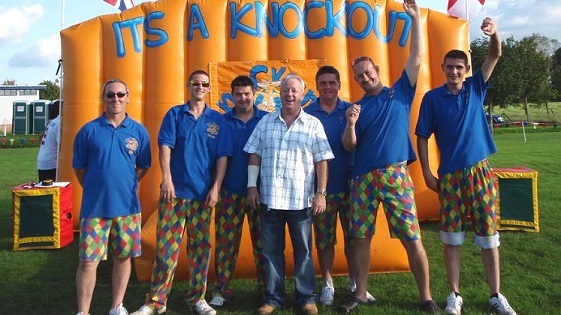 More Its A Knockout Teams. Some teams just simply get specially printed t-shirts made (maybe with a company name on them), and some go way-overboard and create wild and wacky fancy dress along with Joker Cards, Mascots and themed gazebos. Little touches for costumes such as tutu’s, grass skirts, funny wigs and accessories are easy to add. 1. 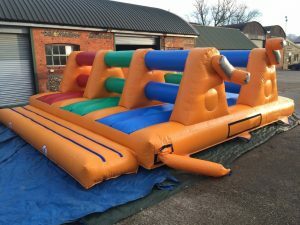 It’s got to be functional, you’ll be climbing through inflatables and doing games. 2. No sharp edges please (sorry Pirate teams, but no swords). 3. No full face or full limb face-painting as it leaves coloured streaks on our It’s A Knockout inflatables (Sorry blue Smurf teams and yellow Minion teams). For more team images and inspiration please visit our Flickr page. Our Silver Show is ideal for medium and large events. It is available in two versions, 8 games, which will last about 4 hours and also as a ten game version. The image below shows the eight game version from 2015. The Silver Show It’s A Knockout games arena. The Silver Show is more inflatable based than the Bronze Show. As an example, the inflatable slide game is bigger on this set of games. Because we need more staff to set up this bigger set of games, it automatically covers up to 18 teams talking part. Other teas can be added. However, after 36 teams we would suggest moving up to the Gold Show. The eight game version needs about half the size of a football pitch in room and is usually ran in two halves. The dry games in Part 1, then the wet or bubbles games in Part 2. Like all our Knockout’s, everyone, in every team, gets the opportunity to take part in every game. No one is left out. Ran as an exciting team event and as a great spectator attraction, the Silver Show makes an impressive addition to large charity fundraising events, family fund days, or entertainment events. More Silver Show It’s A Knockout games. School Activity Days and Youth Events. Our Silver Show is also great for school activity days and youth events. For these days we change the games a little and make them more adrenaline based. Many schools use our games for end of year activity days, fresher days, incentive and reward events. The most students that our Silver Show can cope with in a single session is 480. However, two sessions can be ran in a day (one AM, one PM) meaning that a school with a thousand children can get everyone involved in the fun and excitement. 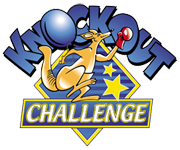 Knockout Challenge offer different scales of games for events. From our Mini Knockout for small team building type days to our Gold Show for large events of 36 teams or more. Please visit our Packages Page for details. The Mini Knockout is a great addition to a team building day or company activity day. Often for team building days with small numbers, say 20 to 60 people, having a couple of hours of games after a mornings conferencing is a great way for delegates to let their hair down in the afternoon. Our Mini Knockout is ideal for this. Six games, with a little dressing-up, inflatables, fun and team bonding. Although the games have some inflatables, there isn’t too much exertion needed from the teams. However, everyone, in every team, can take part in every game if they want to. No one gets left out. The games can include a little extra fun with water and bubbles on a few of the games or it can all be ran dry. As with all our knockout’s we supply arena bunting, have a small P.A. sound system, games commentator and staffing, prizes and bring our own generator for powering it all. It needs about three to four tennis courts in space to be set up nicely as you can see from the image above. Our commentator will narrate the games as they are played our and read out the teams scores to keep the teams enthused to try their best and have a great experience. This set of games is great for up to 8 teams of 8 taking part. Extra teams can be added if required, but we’d suggest if possible then booking one of our bigger shows such as the Bronze Show It’s A Knockout. We have some great addition ideas to help complement and team bond everyone, please contact us to talk through ideas and discuss what works best for your day. We have different scales of knockout games which suit different requirements. So please also see our Packages Page for our other sets of games. Here’s just a quick taste of some of our new inflatables for 2017. Each year we update games and change games around so that the many charities and event organisers that use us year on year get some new and exciting games to play. 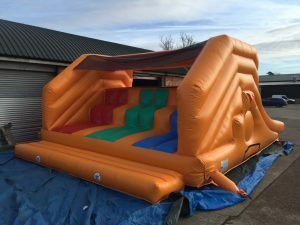 In this blog we’ll be showing off some of our new inflatables, two that are going onto our Silver Show It’s A Knockout and one on our Bronze Show. The Silver Show “Golden Balls” game inflatable. Our new Golden Ball’s Game on the Silver Show uses the Wedge Inflatable shown above. This game can be ran wet (preferred) or dry. This new game is great for all abilities including those with lower body mobility impairments. The new Honey Juice Game. 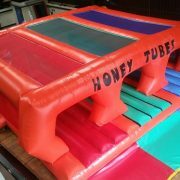 Our new Honey Juice Game on the Silver Show uses the Honey Tubes inflatable obstacle. This water collecting game uses a medium sized inflatable so that lots of “goes” each can be had by the teams. The P-P-Penguin Game (which uses are 8 feet high sumo penguin suits) has this new obstacle for 2017. Our Penguin Game has been mostly unchanged since it’s inception because it is so popular at our It’s A Knockout’s. For 2017 though we’ve spruced the game up with this obstacle. If you would like updated games sheets for our 2017 sets of games, please contact us for details. 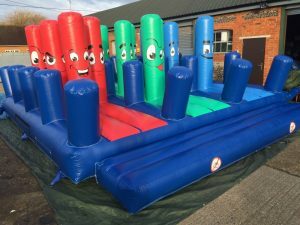 Our It’s A Knockout’s are ideal for charity fundraising events, town & village shows, public/company/family days and corporate entertainment. Please see our Packages Page for details. All of our inflatables comply with BS EN 14960 the guidance for inflatables. Recruiting of teams of the Force Cancer Charity It’s A Knockout 2017 is underway. 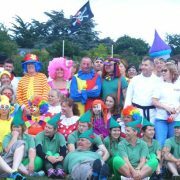 The Force Cancer Charity It’s A Knockout fundraising event this year takes place at Topsham Rugby Cub on Saturday 2nd September 2107. Our twelve game Gold Show will be entertaining the teams again this year. FORCE Cancer Charity is based in Exeter, Devon. They believe that anyone diagnosed with cancer deserves the best possible treatment and professional support close to home. Since 1987 the charity has been funding local research and buying equipment to improve patient care. In 2004 they opened a Cancer Support and Information Centre in the grounds of the Royal Devon & Exeter Hospital. The Centre is open every weekday 9:30-4:30 (Wednesdays 6:30) for people needing physical, emotional, psychological and practical support at a difficult time in their lives. They also offer support and information sessions once a week in the Devon towns of Tiverton and Okehampton. All their services are free of charge. FORCE needs to raise more than £1.2million every year to maintain the services it offers. That money comes from legacies, donations, the FORCE charity shop and from fundraising events. In 2015 FORCE and Knockout Challenge Limited staged a fantastically successful event at Powderham Castle where 72 teams tackled the full Gold Show contest in brilliant sunshine. The day was such a massive hit that a second event ran in 2016, this time at Topsham Rugby Club and in pouring rain. The soggy conditions didn’t detract from another incredible day and the two Knockout Challenge events have raised around £40,000 for FORCE. Click below to see videos of the 2016 Knockout Challenge. Many attractions that are available for hire for school activity events just can’t cope with big numbers, or can’t cope with the temperamental British weather. 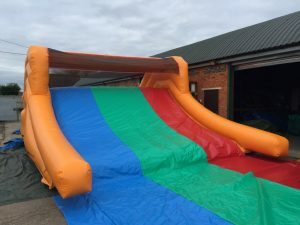 However an It’s A Knockout for Schools can easily cope with numbers over 200-300-400 and more, when run in the right manner and can also be run in all weathers or re-located to a schools sports hall. This makes it ideal for schools activity days. 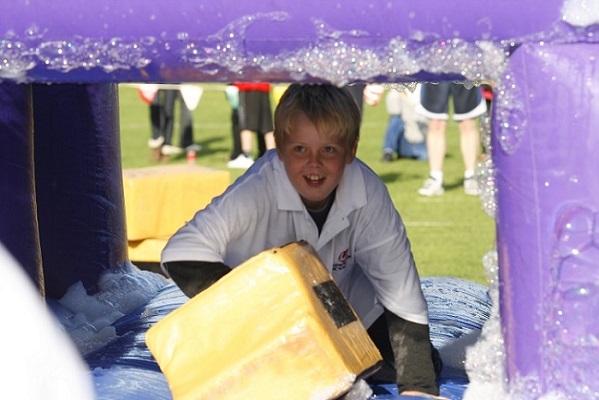 It’s A Knockout for Schools uses games and inflatables that are colourful, fun and exciting. Also, the bigger the set of games, the more inflatables and adrenaline based it is. At Knockout Challenge we offer three sets of games, graded as Bronze Show, Silver Show and Gold Show. Each set with a better and more exciting set of games using more and bigger inflatables. As an example, our “Bronze” set of games needs just under half a football pitch in room, a “Silver Show” just over half a football pitch, and a “Gold Show” needing a whole pitch. Knockout can fit into a morning or afternoon school timetable and can even be run in both, with one set of children (or year group) in the morning and a different set in the afternoon. There are several ways for the children to be split into teams. The games tend to be designed for teams of around ten with each game using three teams per heat. Getting the children into these teams can be done as follows. Forms. If a form has around 30 children it can be split into three sub-teams of around 10 in each, with one sub-team in each of the three lanes for a game. The “times” or scores for the three sub-teams are then added together to give a “form time” for that game. The advantage of this is that the form tutor can remain with their class whilst they go from game to game. Houses. If a house system is being used, groups of ten for each House can play against each other. Or you can let them group themselves into teams. Everyone in every team, gets the chance to take part in every game. No one gets left out. However, individuals can opt out at any time, it just means that someone else does their go for them. We have wristbands available if requested to help with team identity. Why not use the games as a means of fundraising for the school or a chosen cause or charity? Each child could be given a Sponsorship Form to pass around family and friends. If each child was asked to raise £5 or £10 what project or cause could your school use this for? At its full capacity if all the games are active simultaneously, the games arena works like a giant games carousel with teams going from game to game to game. If you imagine the games arena being like a large clock face, with games on each hour hand (as an example) and with the teams positioned on each game. Once a set of three teams have “completed” a game, they then move onto the next game in the rotation (and around the clock). 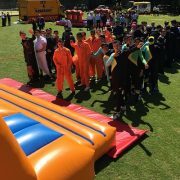 Each of our games for It’s A Knockout for Schools has three lanes (red, blue & green), therefore three teams are active on a game. However, we place up to six teams on each game. The first three teams do the game, then the second three, then the six move onto the next game. This gives a sort of “game-on, game-off” method with some time doing the game, followed by a little rest and cheering time. As an example of a large games/activity day, our Gold Show, which has twelve games, with six teams on each, can easily cope with 720 pupils (if in teams of ten). A games circuit like this could last from two to three hours (or more), but the times can be altered to suit. Usually knockout has wet and bubble games. Dry games can be run if desired, and the games can carry on even if it’s raining. 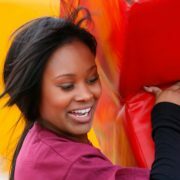 Unlike other activities that you can hire, “It’s A Knockout” will carry on come rain or shine. If you have a sports hall, it can also be ran indoors. The decision can be taken upon our arrival as to “indoors or outdoors”. If you would like some wet games, we only need access to a hosepipe on arrival (laid on to the games area, and until the start time). Two to three hundred gallons of water (about 15 dustbins worth) is all we need for a fantastic effect. We have our own sound system and play party music whilst the games are being played out. Plus with the commentary and all the noise the children are making, “Knockout” makes a great entertaining and colourful event. 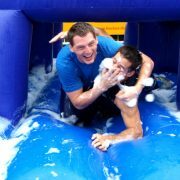 For more images and details about It’s A Knockout for Schools please visit our Schools “It’s A Knockout” Page. It’s A Knockout is pleased to announce the arrival of some great new inflatables for 2015. 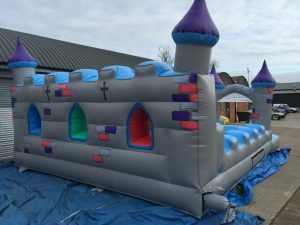 We’ve spent over £20,000.00 adding new and fun inflatables to our collections. We hope you’ll like them and look forward to seeing you at a Knockout Challenge soon. A new inflatable in our Bronze show. Teams will compete to see who can collect the most inflated rings in the shortest time! A new addition to complement the existing ‘Beach Huts’ in the Bronze show, where teams dash through the inflatable, dress a team member in a Bikini Babe Sumo Suit and accessories, then a dash rush back down the inflatable for the dressed up person. The new bubble pit inflatable for the Silver Show. A chaotic, wet ‘Bubble Pit’ game where teams in relay collect different coloured balls from amongst the foamy bubbles. Another new attraction in the Silver Show, this is a great game where teams squeeze through the mangle slots on this fun inflatable. Collect stickers on a padded Velcro jacket as you go. 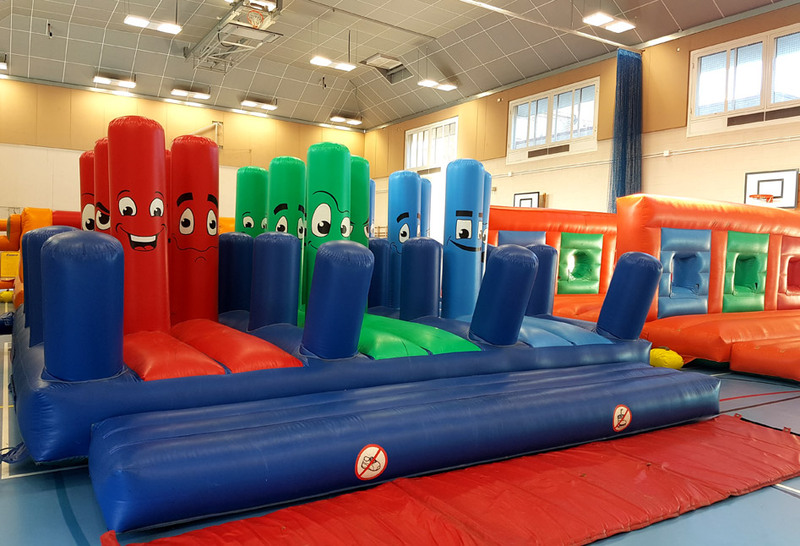 If you are interested in trying out any of these fantastic inflatables, then talk to us about organising a Knockout Challenge or joining one of our Public Events or contact us to organise you own Charity Knockout Challenge Day.